Oil Control Mask.Get instantly brighter, healthier-looking skin. A soft, creamy formula that applies nicely and is also easy to wash off, without drying your face. Gentle exfoliation of glycolic acid removes dead cells and impurities, while antioxidant benefit of organic green tea extracts helps control acne (pimples) over the long run. A must-have product for oily and combination skin types. Natural clays to absorb oil. Glycolic acid for gentle exfoliation of dead cells. Be Good : Plum is always free of parabens, phthalates, propylene glycol, SLS, DEA and PABA. Explore the entire range of Masks & Peels available on Nykaa. 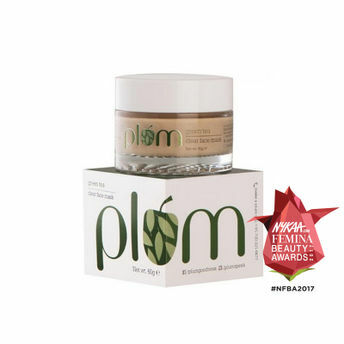 Shop more Plum products here.You can browse through the complete world of Plum Masks & Peels . Name of Mfg / Importer / Brand: Pureplay skin sciences(I)Pvt. Ltd. Address of Mfg / Importer / Brand: Pureplay skin sciences(I)Pvt. Ltd.